In our past two blogs we discussed two important aspects of our company: tackling the gender gap and design for manufacturability. Both of these components are a big part of the Metal Craft / Riverside culture. As a growing company, we’re interested in attracting passionate, educated, and loyal employees. We work with a number of organizations and schools to introduce our career opportunities to students and to educate those interested in the machining industry. We are especially proud of our strong partnerships with the Dunwoody College of Technology, St. Cloud Technical College, and Alexandria Technical College. In fact, one of our engineers teaches at a local school. Our staff also attends career fairs to promote jobs in the machining industry and also frequently opens our facility to student tour groups. Currently, we are actively recruiting for a variety of open positions. Some of our open positions include a 2nd shift Swiss Machinist, a 2nd shift CNC Machinist, a 2nd shift Finisher, a 2nd shift Assembler, an Inspector and a Quality Engineer. Depending on the position, there are a number of different requirements, responsibilities, and duties. 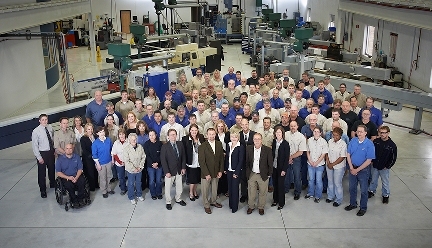 For example, our open 2nd shift CNC Machinist role requires the candidate reads and understands blueprints, job routings, tooling instructions, and standard charts for such specifications as dimensions, tolerances, and tooling instructions such as a type of holding fixtures, cutting speeds, feed rates, and cutting tools to be used. Additionally, the candidate must know how to write programs in FANUC and/or YASNAC language to set specified rotation speeds, feed rates, and depth of cuts (excluding manual turning machinists). Other requirements such as a two year certificate, related experience, and more are required. We also offer a variety of benefits such as health, dental, life and disability insurance, 401 (k), personal time off, paid holidays, and more. Depending on the role and whether a role is part-time or full-time, other benefits are available. Make sure to frequently check out our employment listings to learn more about current openings, requirements, benefits, and job descriptions. This entry was posted in American Manufacturing, STEM and tagged CNC Machinist, Machining Industry, Manufacturing Employment, Open Manufacturing Jobs, STEM Students, Swiss Machinist. Bookmark the permalink.